Access: There are a few different options to reach Daly’s Clearing Hut. We walked in from Franklin Road along the Dean track which is about five kilometres, and took us just under two hours carrying our one and a half year old. The first part of the walk was up through farmland, which is not usually very exciting, but this time the track took us right through a small paddock with lots of dairy cows eyeing us up. After twenty minutes walking we reached the bushline. The track turns sharply as soon as you enter the bush, but unfortunately, we missed the turnoff and had to backtrack after following what turned out to be an animal track. The rest of the track was easy to follow, and although there are two track junctions these are both well marked and easy to navigate. 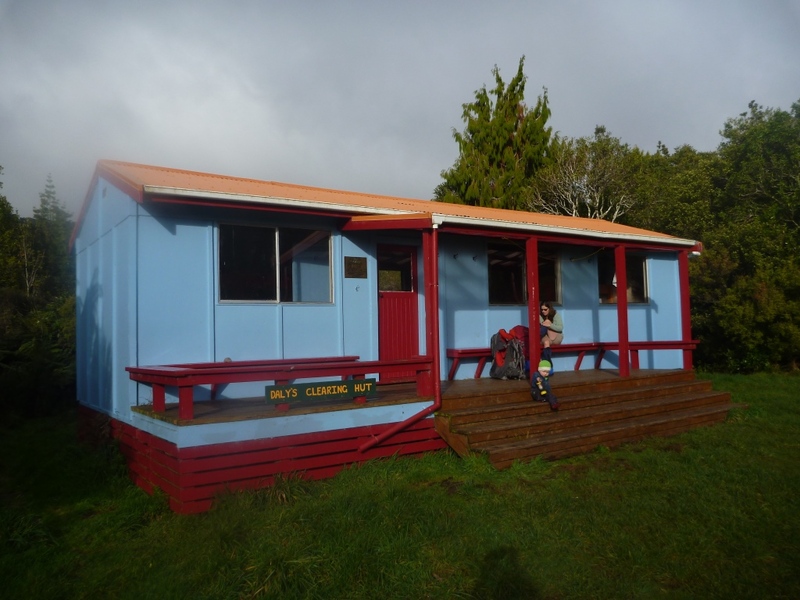 From Daly’s Clearing Hut, it is a half an hour quite steeply downhill to reach the Waitawheta Tramway. From here we walked to Waitawheta Hut (two and a half hours further) but it would also be possible to return directly to Franklin Road along the tramway (less than an hour). Hut features: This is a standard 16 bunk hut with platform bunks in two bunkrooms. There is a central living and cooking area with tables, benches, a cupboard and an inside sink and tap. The hut has a composting toilet close by. There is a grassy area outside the hut, suitable for camping. The hut has recently been painted as part of the Dulux paint-a-hut scheme and has one of the more extreme paint schemes I’ve seen. It was bright blue with red trim and an orange roof. The paint scheme extended inside the hut and to the toilet. Negatives: There is no heating, and it is a little chilly in winter. There were also some resident mice (?) living in the hut, which spent the night scuttling around.